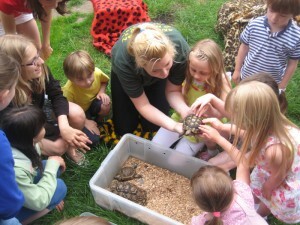 Animal Party Ideas, kids animal handling experiences. Are you looking to host a kids birthday party soon and looking for animal party ideas? There are a number of things you can do to make a very successful animal party. First of all we recommend you take some time in considering where you will have your party. Is your home an option, or do you have somewhere in mind locally that would fit the bill. There are loads of options for Animal Party Ideas, and you need to be smart. Some venues may even have an animal theme already in place. We know of a few different soft play centres that are animal themed and we are often in with our animals providing interactive animal handling experiences. Once you have decided on an party venue for your animal party then you will need to decide on what to do to entertain the children when they are at the party. This is often the most important factor when considering animal party Ideas. The cake is easy, the food is straight forward and even the games are pretty simple, but it’s a different story when it comes to entertaining. We at Animal Man’s Mini Zoo are the largest provider of Animal themed birthday party experiences in Scotland. We’ve been providing animal themed birthday party visits for birthdays, events, schools and nurseries for over about 15 years now. Our Animal birthday parties are a real success and everyone will have a great time enjoying meeting all our animals and getting up close and personal. Our most popular party is our Mini Zoo Party, which is a one hour animal party. We bring along about 11 different animals, reptiles, birds and insects and put on a really tactile animal birthday party experience. Check us out for our animal party ideas. It’s really easy to book, just call 0141-649-7181 or 0131-516-8850 or email Kevin or Kate at animalman@minizoo.org.uk and we’ll send you over all our party details and animal party ideas. How much will it cost for animals to visit a party venue around 21st of February? Hi, my daughters 5th biter day party will be on the 5th of October and I am wondering if you have availability for that also it will be held in Chapelhall, do you cover that area? Hey Nicola, we could do 25th or 27th, the 26th is really busy. We’d love to bring along Barnie to your special day and provide the coolest Dinosaur party for you. Picture the scene, it’s you’re little ones birthday and up rocks the coolest Dinosaur Trailer. The kids go mad with excitement wondering what’s inside. Out comes Barnie the T-Rex, a real dinosaur standing 8 foot high and 12 foot in length, roaring like crazy. Of course he can always come out very calmly and cuddly too if it’s a very young crowd. Anyway, it going to be the biggest and coolest party ever. We’re first in Scotland to bring an actual Dinosaur to birthday parties. Our 35 minute parties are great for impact. Barnie and our Fun Dinosaur Ranger will make sure everyone has the best time. We’ll meet and greet our party hosts, have a roaring competition to see who has the loudest roar, loads of selfies and photos, a bit of feeding time for Barnie, some Dino games, and he also loves to scope the place out, looking for tasty children! Our 35 minute visit is £220 on weekends, £200 on weekdays and 10% off if we can take some pictures for our social media pages. It’s presented by a highly experienced children’s entertainer with 15 years experience, while Barnie is operated by one of our operators inside Barnie. Barnie is so big that he struggles to get through single doors, so we really need to be in a hall or hired venue.